What makes a fourteen year old girl walk over 1500 miles across the desert with her 10 year old cousin and eight year old sister in tow? Is it an unfathomable love for the mother she was taken away from or a blind determination to avoid the alien upbringing she was destined for? Perhaps both of these things topped off with an indomitable human spirit, the sort of wild character trait that makes for the most riveting story telling of all. 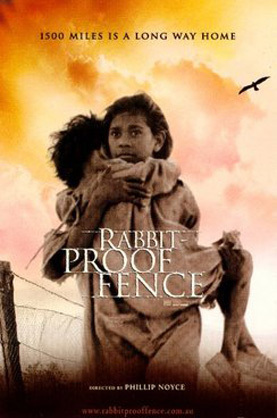 Doris Pilkington Garimara wrote about her mother Molly Craig’s epic journey from the Moore River Native Settlement back to her home at Jigalong in the Gibson Desert in the 1996 book Follow The Rabbit Proof Fence. Documentary maker Christine Olsen snapped up the rights and turned it into such a page-turner of a screenplay that director Philip Noyce was lured back home from the glitz of Hollywood to shoot it with crack Aussie D.O.P. Christopher Doyle and an all round top notch cast. Kenneth Branagh as the notorious A.O. Neville, Western Australia’s Chief Protector of Aborigines creates a fully fleshed out portrait of a man convinced of the beneficial nature of his maniacal mission and makes the government’s obsession with skin colour back in 1931 a living reality. David Gulpilil dominates the screen whenever he appears as the conflicted tracker Moodoo while Ningali Lawford and her mother Mayan bring true soul to the roles of Molly’s mother and grandmother respectively. However it’s the three young girls; Tianna Sansbury as Daisy, Laura Monaghan as Gracie and most importantly Everlyn Sampi as Molly, that breath the life force into this amazing tale. It’s incredible enough that these girls actually made this journey but when you discover in the Epilogue that Molly did it all over again after she and her daughters were stolen from their homeland a second time, your heart almost breaks. This was the first feature to tackle the shocking subject of the Stolen Generation head on and faced with such a graphic depiction many people simply denied that it actually happened. Admittedly it does seem unbelievable that the Australian Government had a policy of removing children from their families but as Noyce points out in the DVD commentary, ‘the psychological dislocation of policies ended thirty years ago are still very much in evidence’ today. This film is a small step towards understanding that history and acknowledging that pain. It’s also a damn fine piece of Australian cinema.